"Merry Christmas, Justice League -- Now Die!" Welcome to the Tenth Day of Christmas on Infinite Earths... getting this one in a bit later than I'd have preferred... had myself a bit of a fender bender last night and wasn't able to have this one ready to go first thing in the morning. Everyone's okay, and the damage is relatively minor... have a bit of a throbbing ache in my pride, however. Hey guess what day it is... yup, it's Christmas Eve... and Plastic Man is celebrating with Woozy Winks and his family... that is to say, his sister Wanda Winks and her son Weezer Winks. Man, these family names, am I right? Anyhoo... it's getting late into the evening, and li'l Weez needs to get to bed if he wants Santa Claus to visit. Plas scoops him up spatula-style and deposits the tot in his bed. Weezer ain't all that interested... he thinks Santa is lame (and/or fake) anyway. 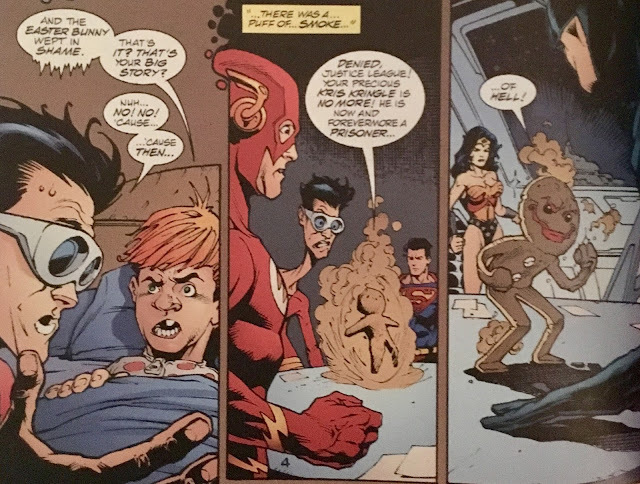 Plastic Man is all "au contraire" and decides to tell him about the time Kris Kringle joined the Justice League of America. Weezer is skeptical... but open to hearing Plas' case for Santa's coolness. 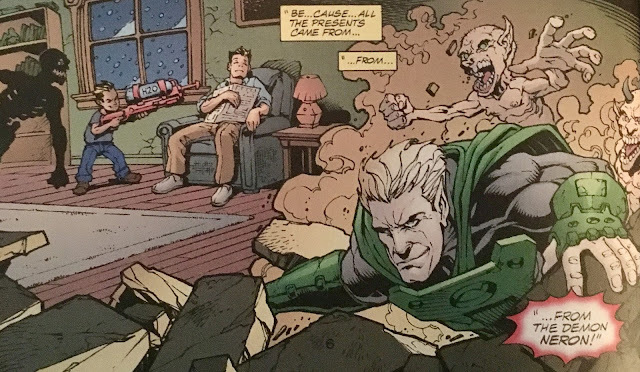 His joining was just the night prior in fact, probably so they could portray Kyle as Green Lantern. 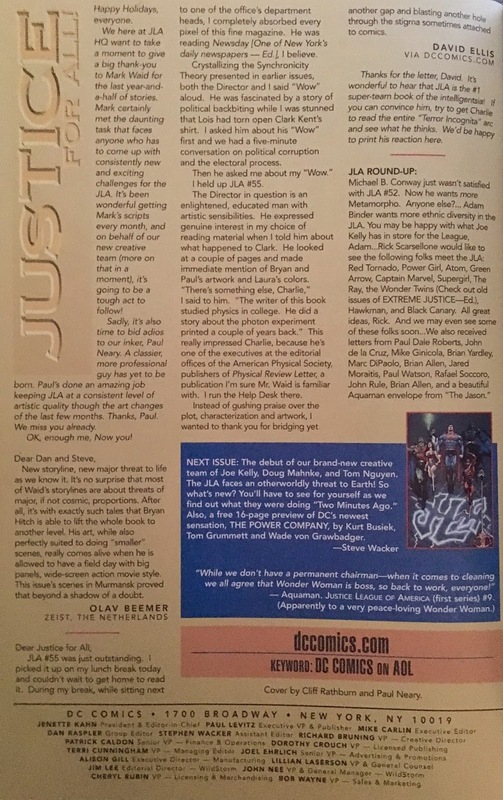 If what I heard is true... DC was very much against using Hal or Barry even in flashback at this point, as they felt the newbies would be overshadowed their predecessors. There was also no plan on bringing either Silver Age fella back anyway... and as we now know, DC never would! Ahem... Plastic Man's story is basically this... the League is sitting around a table, and they decide to give Santa membership... the end! Well, funny as that story is to you and me, that just ain't enough for Weezer... and so, Plas continues... with a demonic Gingerbread Man appearing on the table. He claims that Santa cannot join the League, for he is currently a prisoner... of Hell! The Gingerbread Man continues... it seems that Santa's workshop has fallen on hard times. He's had to lay off all of the elves, because the naughty vs. nice ratio has fallen 70% this year... and so, supply is just killing demand. It turns out that all these bad kids have already received gifts... but not from Santa... from, Neron! Yeah, Underworld Unleashed's big bad! And so, Santa travels to Neron's fortress/home/headquarters... which is conveniently located in New Jersey. He is shocked to find that Neron has his own workshop, complete with elves! After monologuing for a few panels, Neron captures St. Nick under glass. 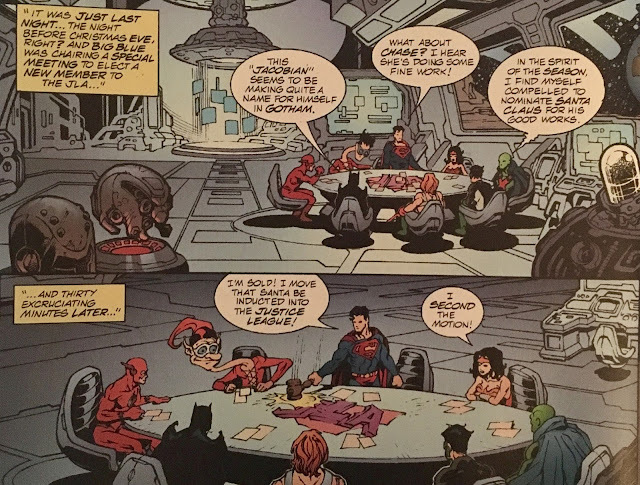 Back on the Satellite, Superman decides it's time for the JLA to "go to Hell", and so they do! 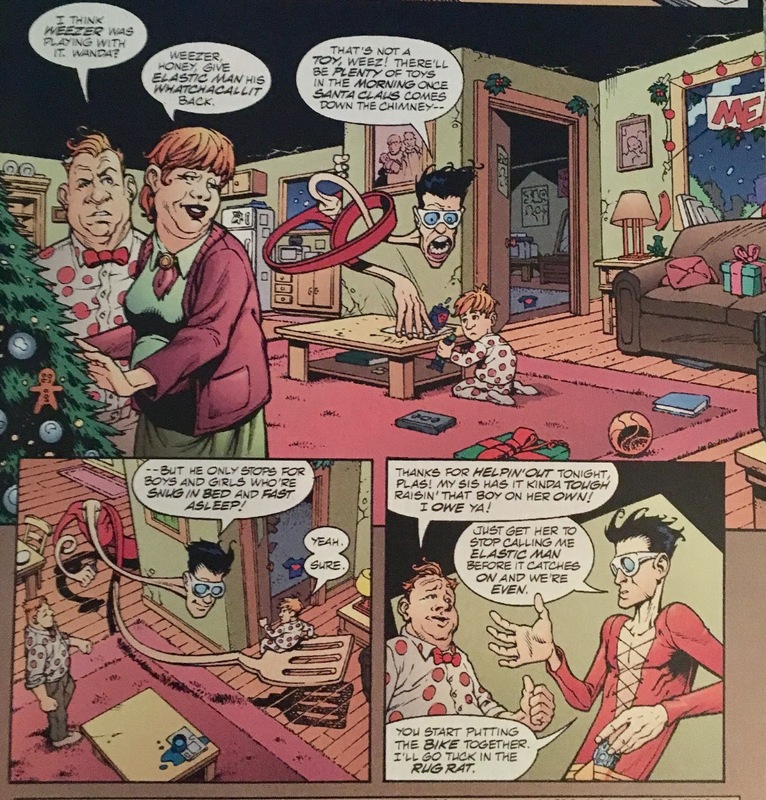 But not before Plastic Man eats the demonic Gingerbread Man... this isn't alluding to anything to come, just a funny sight gag. A battle rages, the League and elves pretty much fight to a standstill with neither having any real advantage. They come across a mint-in-package Santa Claus... that is to say, Santa inside an action figure package. All the while, Neron is hanging stockings by the chimney... with care. 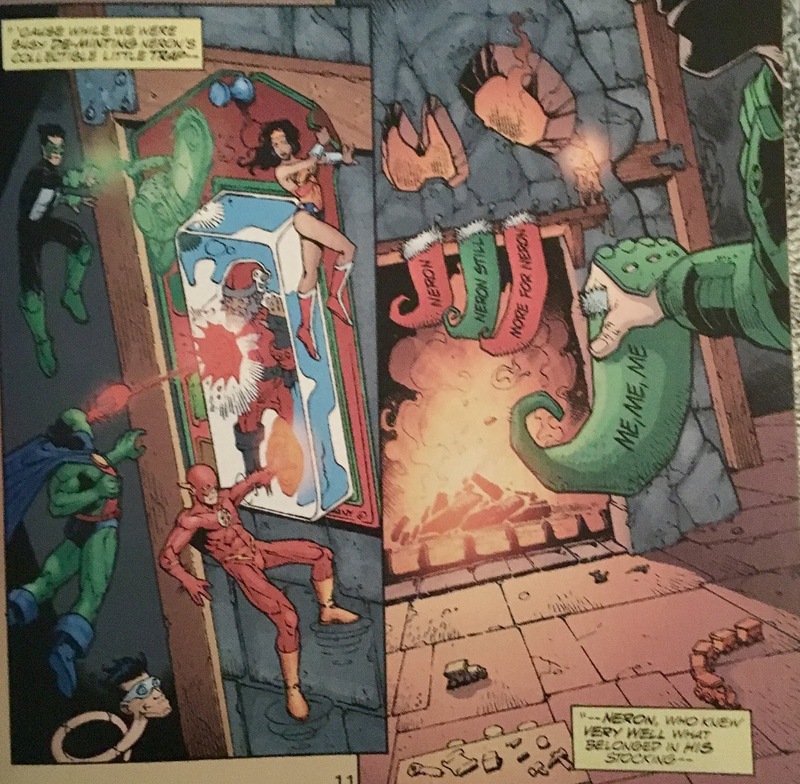 With his stockings in place, Neron turns his attention to the League... and turns them into coal. At this point, Santa's getting pretty ticked... and so, he uses his... ahem, heat-vision to burn his way out of his packaging (and thereby lowering his "book value" exponentially). 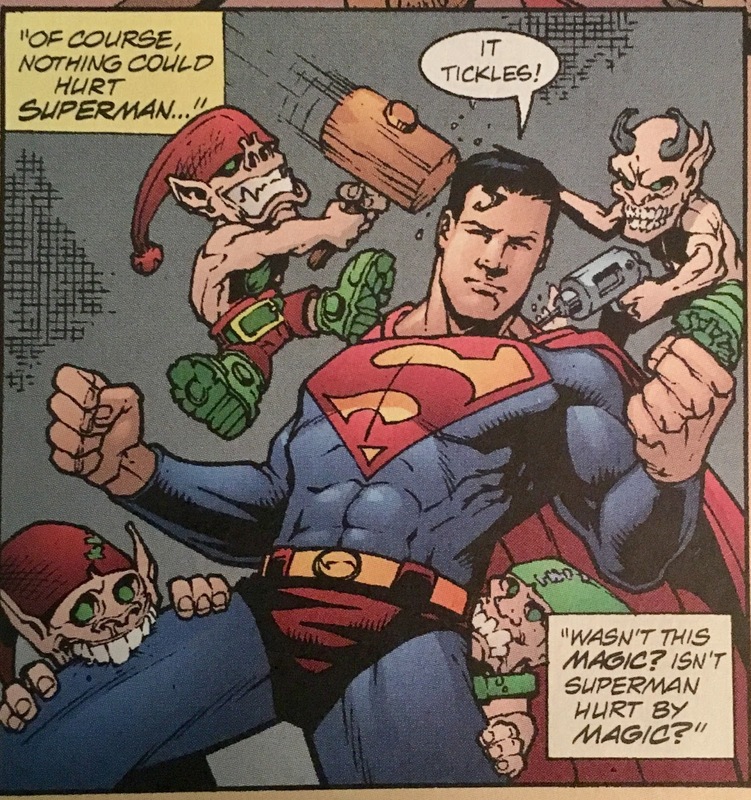 He then takes to beating the heck out of the evil elves... oi, try typing that three times fast... until of course, they overtake him. He is stood before Neron... and it's as if by design... he has Neron's one weakness... a gift! 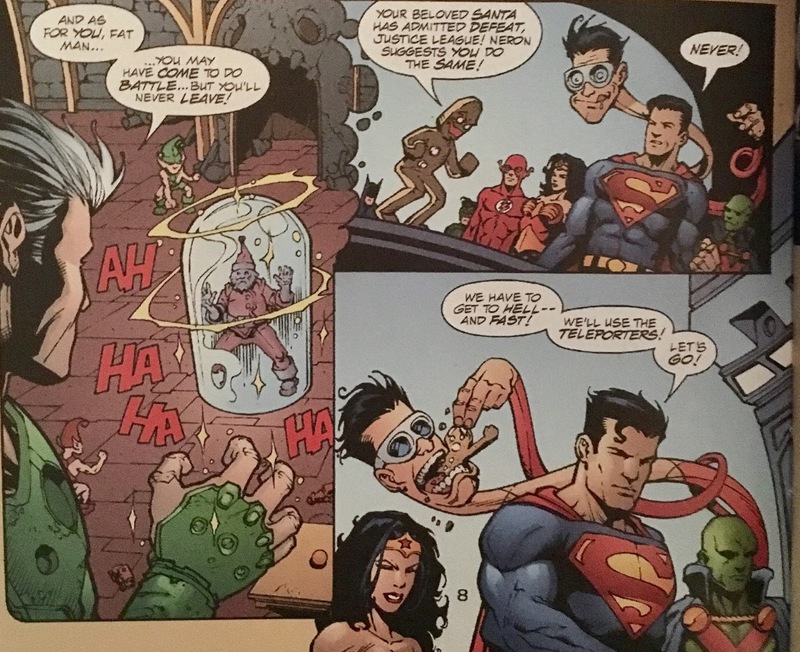 Ya see, if we know anything about Neron, it's that he is all about the "exchange"... the "bargain", if you weee'll. 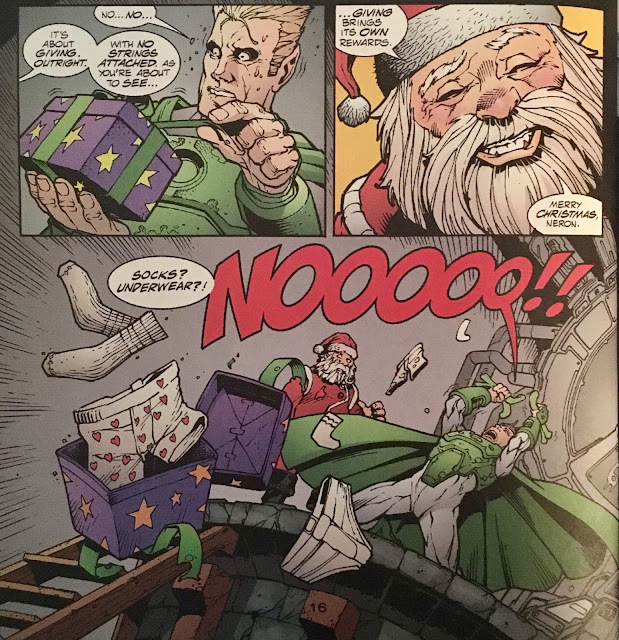 Santa gives him a present... which Neron has no choice but to open... and when he finally does, he is beaten by... well, the same thing that destroys my cheer on Christmas too... underwear and socks. 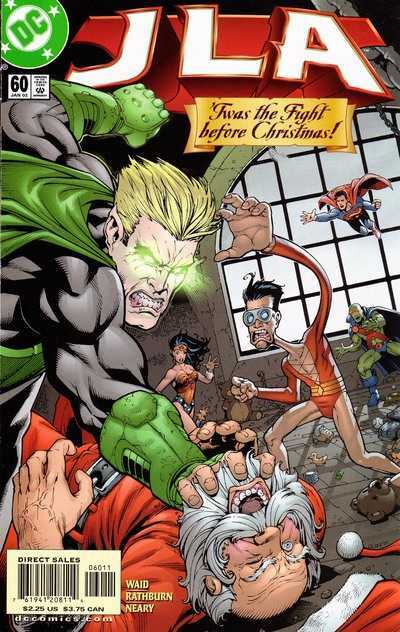 And so, Santa saves the day... and the Justice League. 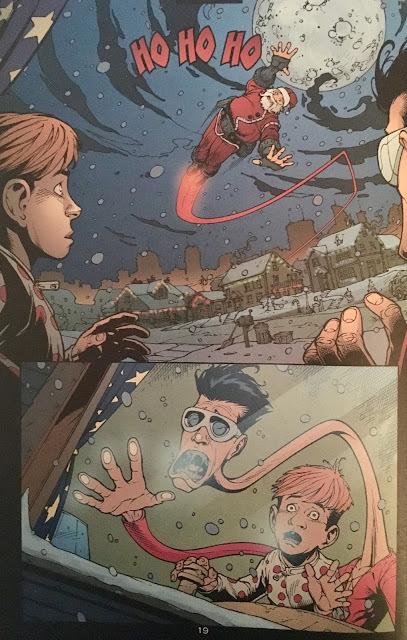 Back in the present, Weezer still ain't impressed... he begins to point out plot-holes in Plastic Man's story... the kid must be a comics fan, right? Suddenly, outside there arose such a clatter... Plas and Weez sprang from the bed to see what was the matter...outside the window, they saw... Santa Claus flying by! A Santa with heat-vision, even! Well, this is enough for Weezer to believe... and so he buries himself in his covers to make sure he's asleep before the visit. 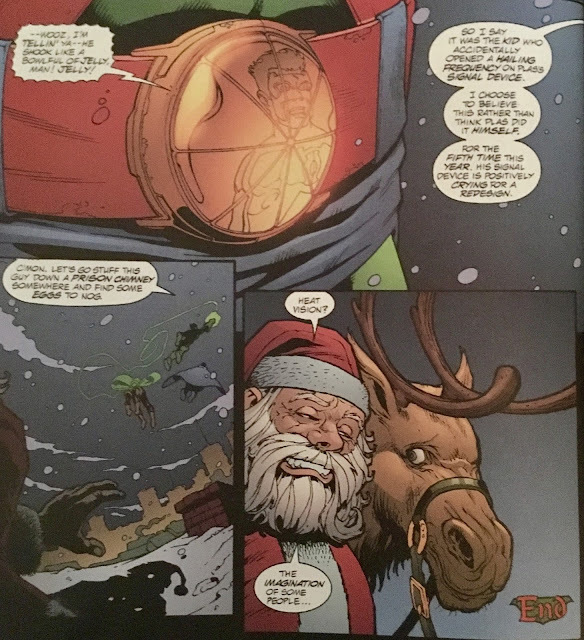 We wrap up by learning that this "Santa" was actually the Martian Manhunter who along with Green Lantern overheard Plastic Man's tale while in the neighborhood dealing with Commander Dinosaur (? ), and realized he needed some assistance. 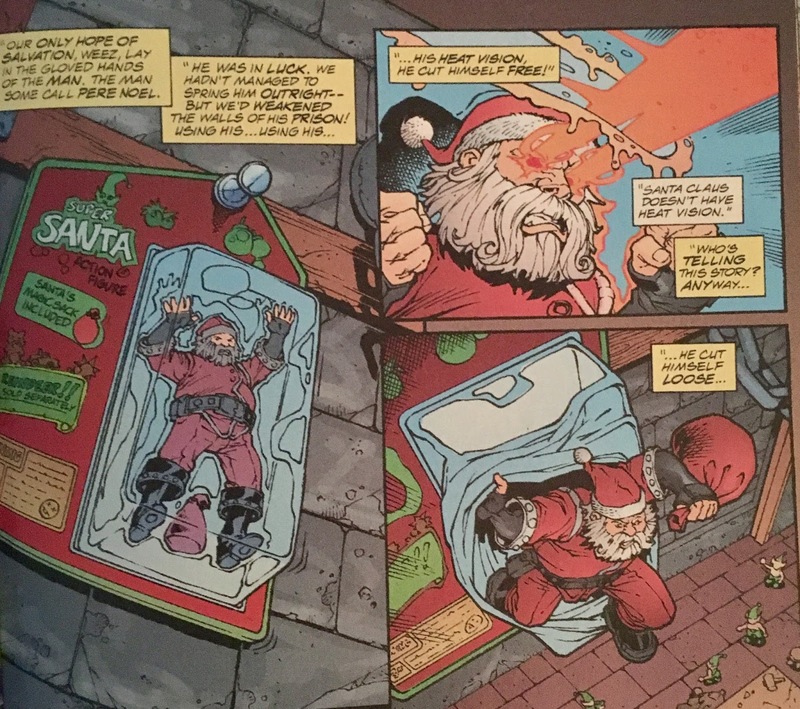 As J'onn and Kyle head out, we see the real deal Santa Clause scoffing at the thought of his having heat-vision. Now just how fun was that? 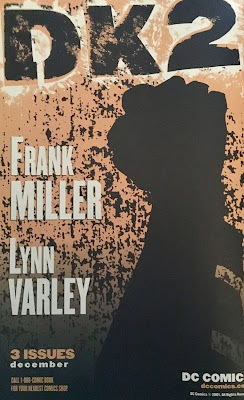 It's not terribly often we come across what is, basically, a silly throwaway story... that has so much heart to it. 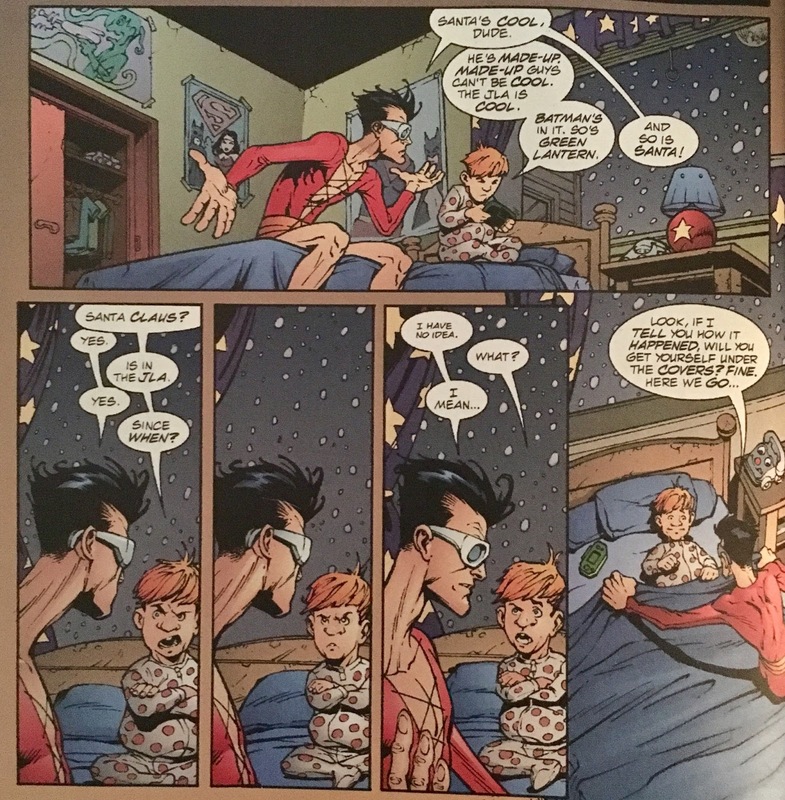 Plastic Man is one of those characters I feel like I really need to be in the mood for... this issue kind of transcends that feeling. I think he was the perfect fit for this one. Loved how his story had to escalate... and had some plot holes... that li'l Weez had to point out to him. Gotta wonder if the tot was some sort of commentary for continuity cranks like myself? 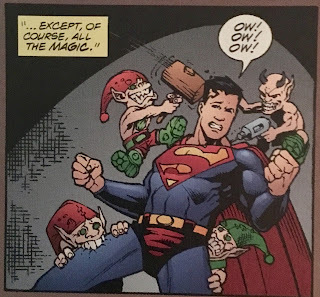 I sometimes recoil in terror when I see the words "Guest Pencils" on a given credits list, but I gotta say... Rathburn turned in some great work here. 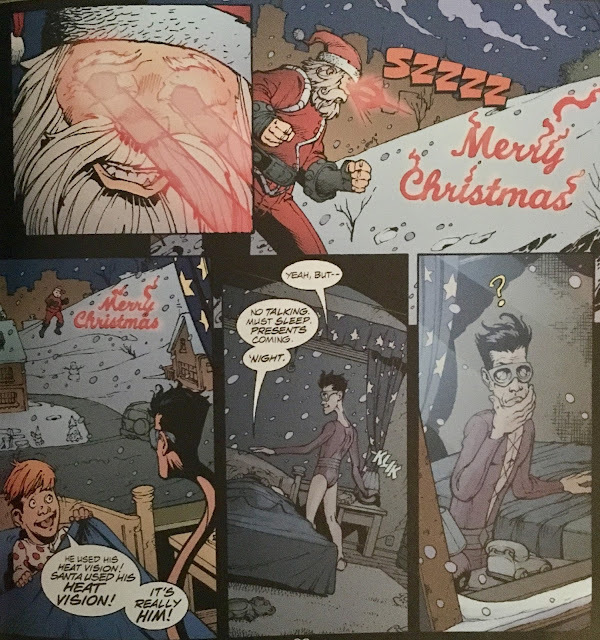 Really liked his depictions of the League... his Santa, may be been a bit "extreme" for my tastes, however, I think the story required that. One thing I wasn't too keen on was Woozy Winks being drawn to be realistic. He's really a strange looking fella, who I feel is better served when drawn to be more "toony". If I'm not mistaken, this was Mark Waid's final issue before Joe Kelly came in to use the League as continuous political commentary move the characters forward. 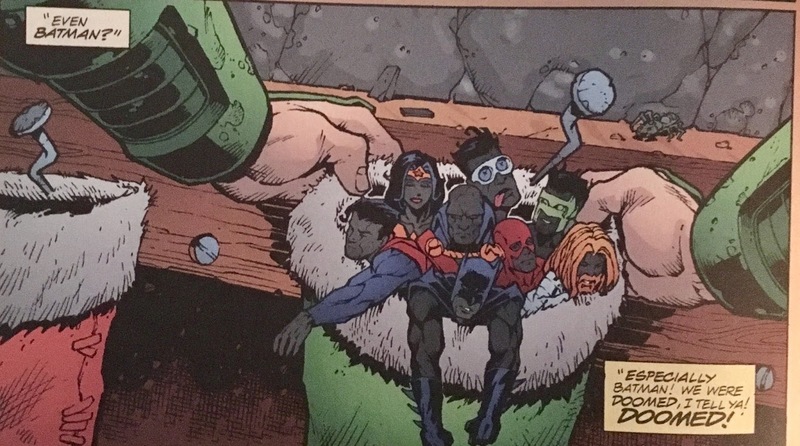 It's a fitting way for Waid to say "goodbye", as it feels like it was a real celebration of the team, and just how magical they can all be to children in the DC Universe.